Fuller Center Disaster ReBuilders, Inc., dedicated their first house as a FCH mission partner on Wednesday in Bay St. Louis, Miss. The organization, headed by Bartow Tucker, has built 83 houses, but this was their first with The Fuller Center. 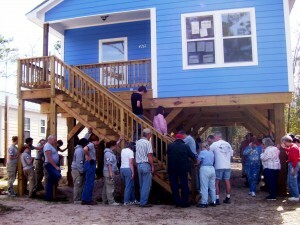 The house was built on the property of Andy Favre, who had lived there in a trailer for 22 years before hurricane Katrina hit. The eye of the storm passed over Bay St. Louis, flooding Favre’s home with 12 feet of water. The new house was begun shortly before Thanksgiving with a sponsorship from the Indiana District, Lutheran Church Missouri Synod. In addition, teams of volunteers from the Indiana District, Luthern Church came to support the building efforts, raising the house on piers to prevent future flooding. Groups rotated through the area weekly to keep the building efforts going forward. At the dedication, Favre was presented with a Bible and a handmade quilt. To continue with the efforts of rebuilding after the devastation along the Gulf coast volunteers are still needed to support this effort. Please contact Fuller Center Disaster ReBuilders at 228-365-2734 or DisasterRebuilders@fullercenter.org.